A map of temperatures across the globe on Dec. 27, 2017, shows that unusually warm temperatures in the Arctic coincided with a deep freeze in the northeastern United States, including Maine. A new study suggests there is a correlation between warm spells near the North Pole and the frequency of winter storms in the Northeast. The two nor’easters that together dumped more than two feet of snow throughout much of Maine in the past week — and more than three feet in some areas — could have been fueled by warming temperatures in the Arctic, according to a new scientific study. As periods of warmer winter weather occur in and around the Arctic Ocean, cold air gets displaced and moves further south, where it encounters comparatively warmer air and produces blizzards or other winter storms, the study’s authors say. The study was conducted by Judah Cohen of MIT; Karl Pfeiffer of Atmospheric and Environmental Research in Lexington, Massachusetts; and Jennifer A. Francis of Rutgers University. The data they examined was weather and temperature records between 1950 and 2016 for the Arctic region and for 12 American cities: Atlanta; Bismarck, North Dakota; Boston; Chicago; Detroit; Des Moine; Duluth, Minnesota; Helena, Montana; New York City; Salt Lake City; Seattle; and Washington, D.C.
Sean Birkel, Maine’s official climatologist and a professor at the University of Maine in Orono, said Monday that while a scientific cause-and-effect between the warming Arctic and more frequent nor’easters has not been proven, the data reported in the study suggests a correlation between the two. Cold snaps in the Northeast seem to coincide with warm spells in the Arctic, he said. The storms that have whipped up strong winds or dumped heavy snow, or both, in the region have resulted from warm, wet air moving north along the Atlantic seaboard and colliding with colder air than has moved south and east from Canada, he said. “I think the study is fundamentally right, but it’s not yet proven,” Birkel said. Birkel, who tracks weather patterns and forecasts at UMaine’s Climate Reanalyzer website, said that there has been a correlation between warm spells in the Arctic and winter storms in Maine specifically — another one of which is expected Wednesday night. There were above-average temperatures in the Arctic in February 2015, he noted, when the Northeast had one of its coldest months on record and a series of significant storms buried the Down East coast under 10 feet of snow. A blizzard in February 2017 that dumped more than two feet of snow in parts of Maine also coincided with warm temperatures near the North Pole. Periods of unusual winter warmth occurred in the Arctic earlier this winter, too, at the same time that Maine was gripped in a deep freeze in late December and early January, Birkel said. 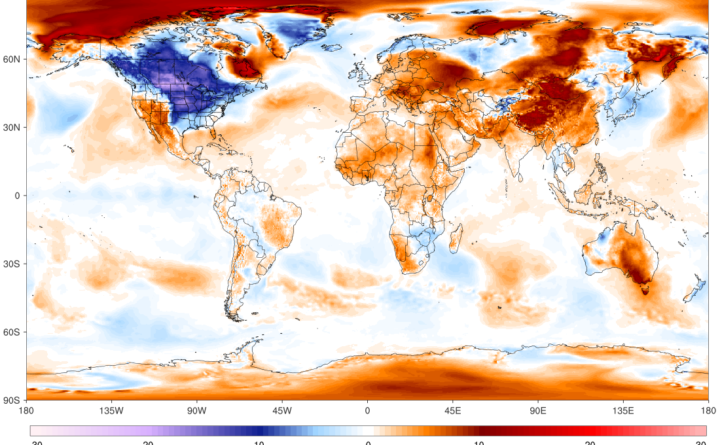 Siberia, on the other hand, has had similarly warm temperatures as the Arctic when cold air has gripped the northeastern U.S. and Atlantic Canada. “These intense storms require cold air being pushed out of the Arctic,” Birkel said. Still, the meteorological mechanism by which warm spells in the Arctic might be causing cold air to move specifically over the Northeast has not been explained, Birkel said. It’s unknown whether ozone levels or warming in upper layers of the atmosphere, rather than just at the surface, might play a role. The increased intensity of tropical storms in the Northeast has been linked to warming temperatures in the Atlantic Ocean, independent of changes happening in the Arctic. There is some evidence of a natural cycle to the frequency of storms, Birkel said, which could cause some to argue that the cluster of nor’easters stems more from that phenomenon than from global climate change.